Admit it, you googled ‘how to floss’ in an attempt to learn the ever popular video game dance that’s all the rage. Sorry to disappoint, but as a Brookline dentist office, we’d love to teach you our style of the floss. It begins with a piece of mint-covered string and your beautiful smile. And, if you floss each day, you’ll be rewarded with more than a high score in a video game. You’ll win a smile that lasts a lifetime. 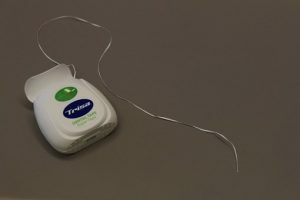 Daily flossing is an important part of your oral hygiene routine. The action removes food particles and plaque from your teeth. Simply brushing with toothpaste doesn’t always remove the bacterium that forms on teeth. Floss lets you clear out the hidden area below the gum line as well as the tiny crevices between each tooth. If you don’t floss, these areas become prone to cavities. Additionally, you can develop gum disease which leads to periodontitis. Periodontal disease destroys the bones and soft tissue of your oral cavity. If untreated, it leads to heart problems and serious health issues. Measure a piece a floss to use. Generally, 15-18 inches works well. Pinch the ends of the floss between your thumb and index fingers and roll it onto your index fingers on each hand. Using your middle fingers as a guide, gently press the floss between each tooth. Move the floss at a slight angle to clean below the gum line. Floss between every tooth and don’t forget the back of your molars. When you have finished, rinse your mouth out (swish and spit) with water or mouthwash. The great thing about a daily flossing habit is that you ensure your teeth are free of plaque and you’re sure to have fresh breath. The bacteria in your mouth which turns to plaque and later tartar, if not removed, causes halitosis as well as gum disease. Help younger children floss their teeth or provide flossers which are perfect for their little hands. With a little practice and some help from your Brookline dentist team, your mouth will be clean and fresh. Even better, now you know two ways to floss. Follow us on Facebook for more tips on oral health or give our office a call if you need a short education on flossing. We might not know how to do the dance, but we promise we can give you a winning smile.